Fans of the Alabama Shakes can rejoice after the release of Sound and Color because the band delivers everything you’d want to hear and more in its sophomore album. The album stands out and delivers in a way that is rare in music today and while it’s almost schizophrenic at times, stylistically it might just be a masterwork. The 12 tracks are a blend of passion, playfulness, and surprising music that manages to be both modern and a bit nostalgic at times with flavors of funk, soul, rock, and everything in between. It begins with the title track, which serves as a perfect introduction with its offbeat varied tempo, high production value, and of course Brittany Howard’s soulful, heartfelt vocals. This is followed up with one of the strongest songs on the album, “Don’t Wanna Fight,” which is exemplary of why the album is so great with its quirky vocals, great hooks, and unique but appealing sound. The real standout, instant-classic track is “Gimme All Your Love,” which is addictive in its wistful notes, which intensify and build into a hugely climatic bridge and emotional close. The album is filled with a blend of very different and somewhat experimental approaches and R&B/hard rock theatrics in songs like “Dunes,” “Future People,” “The Greatest,” and “Shoegaze,” which are unexpected but welcome. 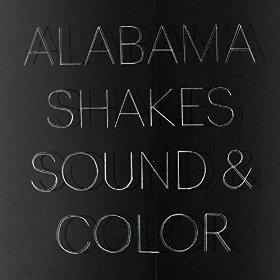 Sound and Color is the kind of album that turns a casual fan into a die-hard follower and elevates Alabama Shakes to a whole new level. It was always clear that singer Brittany Howard was something special, but the musicianship of the entire band is illustrated at times on the album and together, they created an album that sets a new bar.